SWF or Small Web Format files are used to display action script, multimedia as well as animated vector graphics. It was developed by Macromedia and now it is a product of Adobe. It is mainly an Adobe Flash file layout which can also be used to stream flash videos over the web. The SWF files can be created with various products of Adobe, such as after effects, flash builders and others. You can easily share the SWF files with your friends in your personal blogs. In addition to this, you can find various free media players available on the Internet that supports SWF. As MP4 is not a perfect format for sharing videos on your websites and blogs, that’s why MP4 files are needed to convert to SWF online. SWF is perfect to do this job because it has small size as well as good quality for uploading videos onto websites. Moreover, SWF format is very popular file format nowadays because it shows the animated content on the Internet and has the ability to store animation or applets. There are various online converters available on the Internet for converting MP4 to SWF. But online converters have their own limitations, if you want to convert videos in batch and requires the conversion speed and conversion quality, you'd better find an alternative to convert MP4 to SWF online. Among all of them, the best is Wondershare UniConverter (originally Wondershare Video Converter Ultimate) which is developed by Wondershare company. This is well-known for its outstanding features and is very simple to use. It can convert a video up to 158 formats. If you want to add music to your videos, then this is also possible achievable for this converter. Wondershare UniConverter (originally Wondershare Video Converter Ultimate) is highly reckoned due to its excellent capability to capture as well as download web videos with just a click. Convert various formats to SWF: This has the ability of converting any type of video into SWF format, including MOV, MP4, AVCHD(MTS/M2TS), AVI, WMV and many others. Wonderful Video Editor: The videos in this converter can be enhanced by editing and you will also get the best quality video. There are many editing options which very easy to use such as cropping, adding special effects, brightness, exposure, lighting, trimming etc. You can feel a good experience by using this video converter, as this has a very high speed and broad format support. DVD burner/ripper: Adding all supported media files from local folder and enables users to change ISO file name and DVD folder. Also, you can burn your videos to the DVDs. 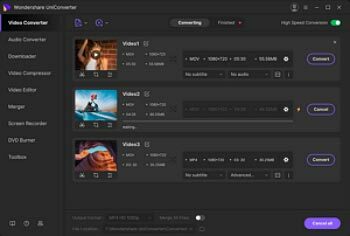 Video downloader/recorder: Wondershare UniConverter (originally Wondershare Video Converter Ultimate) allows you to download videos from websites, besides, you can record videos from websites or your desktop. This is one of the most popular online tools that claim to convert anything to anything. 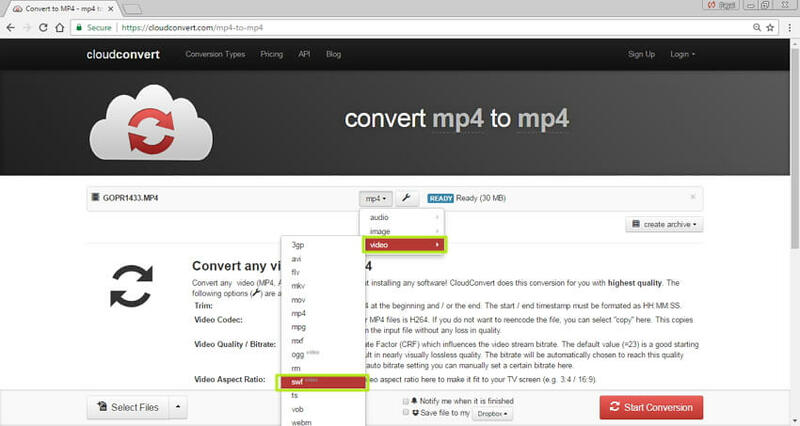 Using the converter you can easily convert your desired MP4 files to SWF format within no time. The tool supports more than 200 formats including videos, audios, images, ebook, archive, documents, presentation and spreadsheet. Folder monitoring and batch conversion are also supported by the converter. Assuring the safety of your files, the tool ensures that only you can access them and it also deletes them after the conversion process. 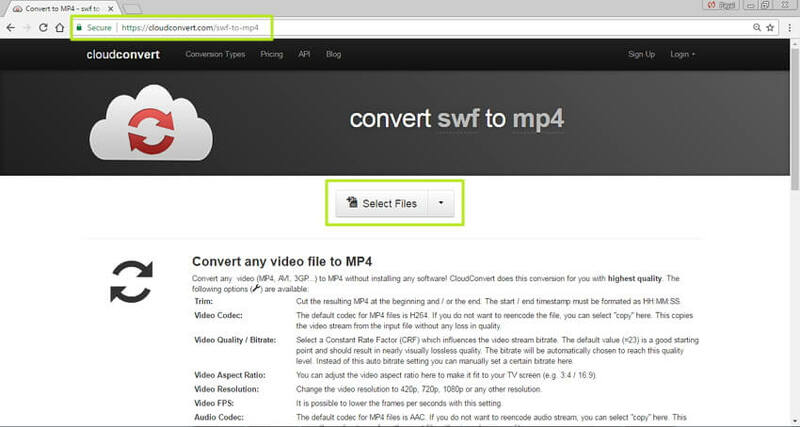 Step 1 On your browser, open https://cloudconvert.com/swf-to-mp4 and click “Select Files” and add the desired MP4 file from your PC. Step 2 Once MP4 is selected, click drop down arrow and select SWF from video category as converted file option. Finally, click “Start Conversion” to initiate the process. Step 3 Upon process completion, download converted file from the site. Another decent tool for taking care of your conversion needs is Convertio. 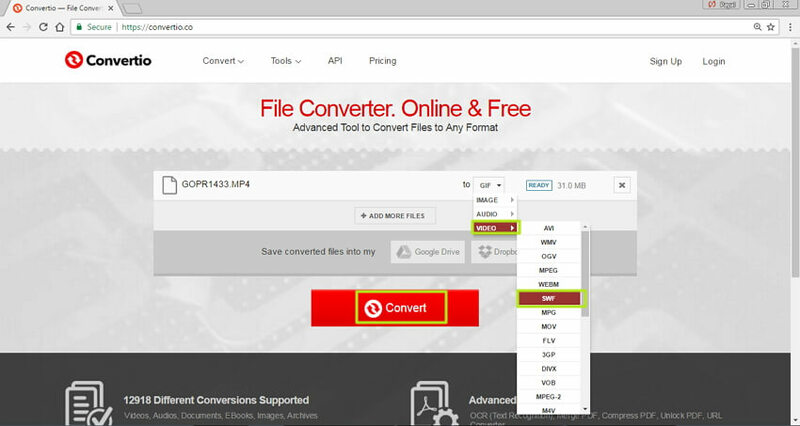 This free online file converter is an advanced tool that supports around 12918 different types of conversions including videos, audios, images, documents, archives, Ebooks, and others. In addition, to file conversion, it can also merge, unlock, and compress PDF, supports OCR text recognition and can also convert URL. Using Convertor you can add files from your computer, Dropbox, Google Drive as well as URL for conversion. The converted files can be downloaded from the site or can also be directly sent to Google Drive or Dropbox. Step 1 Open https://convertio.co/ on your PC browser. 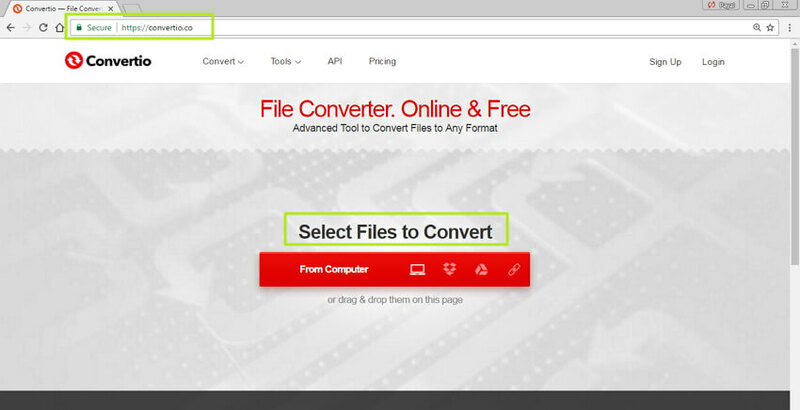 Click “Select Files to Convert” to add desired MP4 file. 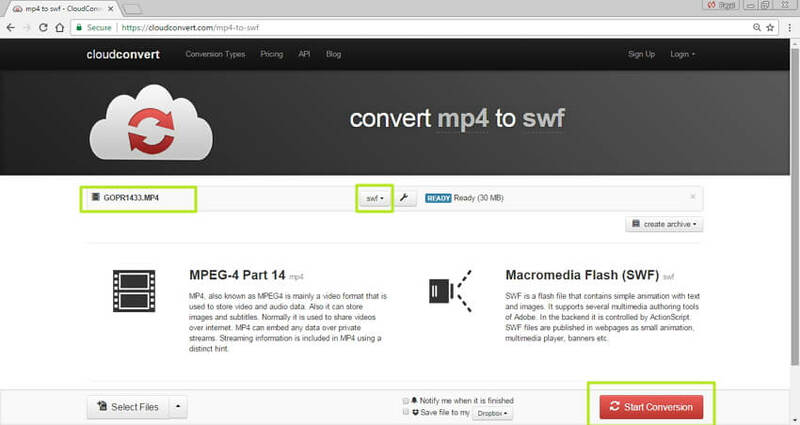 Step 2 Select SWF from Video category as output format and click “Convert” that will successfully convert MP4 to SWF online. Step 3 Once the conversion process is complete, the SWF file will be available for download on the site. 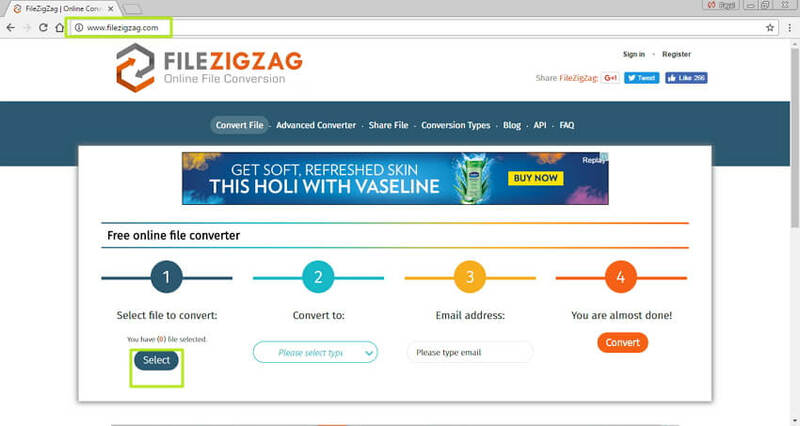 Filezigzag is another popular online converter that allows to converting your MP4 files to SWF format. The software supports an array of formats for different types of conversions including video, audio, image, archive, documents and others. The converted files are sent to the mentioned email id from where they can be easily downloaded. In addition to file conversion, it also supports additional services like file sharing and free cloud storage. 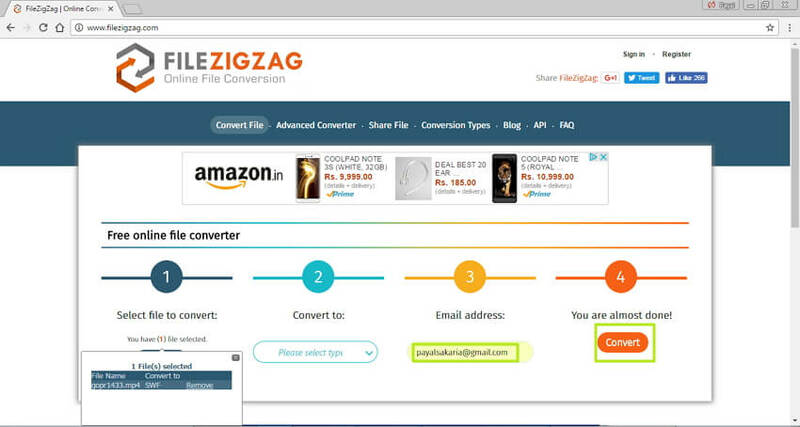 Thus you can convert your files, store them as well as securely share them using filezigzag. 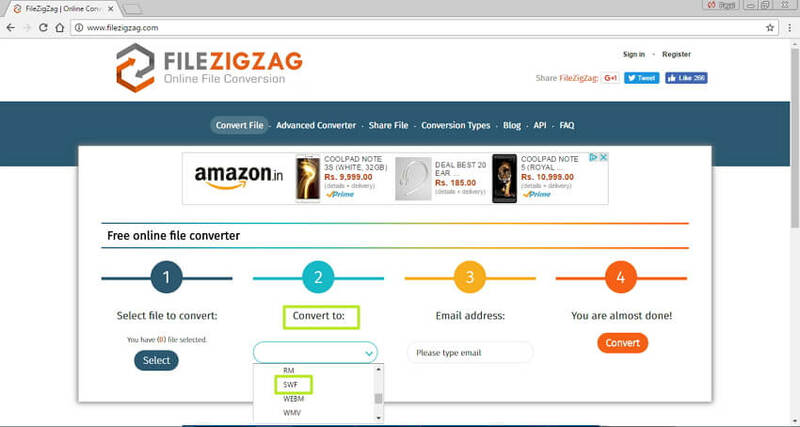 Step 1 On your PC browser open http://www.filezigzag.com/ and select file to convert by clicking “Select”. Step 2 Once the file is added to the tool, select SWF format from “Convert To” option. Step 3 Enter your email address to which you wish to send the converted file and click “Convert”. The file will be successfully converted and can be downloaded from your mail id. Use any one of the above tools and convert MP4 to SWF online for free and without installing any third party software.